Here is my menu plan for this week. Gearing up to begin school; not knocking myself out making vegan meals. Eating vegan, but only showing a carnivor-ish menu plan. 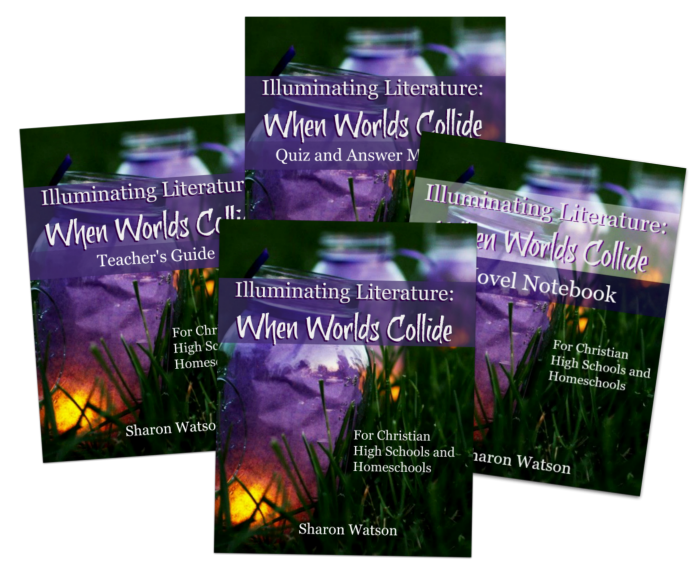 I've been receiving emails with writing tips from Sharon Watson for some time now, so I was delighted to learn that I would get to review a product from Writing with Sharon Watson. Pudd'nhead Wilson, by Mark Twain and The War of the Worlds, by H.G. Wells. I requested this review because I was intrigued by the literature choices. I am quite familiar with Mark Twain, but I had never heard of Pudd'nhead Wilson. I already possessed a borrowed copy of The War of the Worlds but had never used it as a high school literature choice. Now we all know that delight when a box of new school materials arrives on the front door-step. There is that anticipation as you gently slice through the packaging tape. But I have to tell you, the "Wow Factor" of this program jumps out at you when you fold back the flaps of the box. This cover and the color combinations are just stunning. I still love looking at the photo of--well... canning jars in a row in some long grass. The jars look like they contain lavender liquid, yet there is a glow at the bottom, brighter than lightning bugs, and maybe a lit candle. Under liquid. How did they do that? Diving into a program like this, with four books and so much content, the first question the student and teacher ask is, "Where do I start?" The teacher has the "Teacher's Guide", and the book that is not specifically marked is the student's main book. 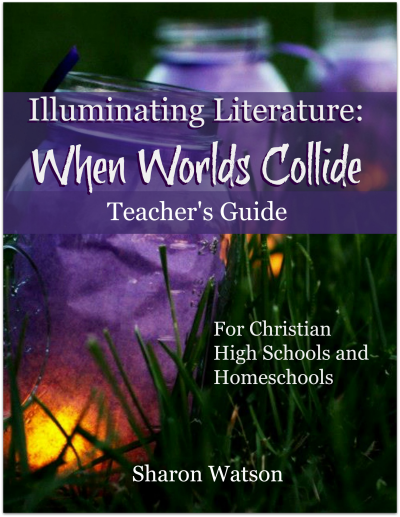 The teacher, the bibliophile, lovingly flips through page-by-page, glancing at the cover pages, information about other books, a multi-paged Table of Contents, and lands on a page that begins, "About the Course: Welcome, Teacher!" A typical student looks at the cover, not opening the book until instructed to, "Go to page ___." If your student is also a bibliophile, he/she may begin the way mom did, flipping curiously through the beginning pages and stopping abruptly, yet with certainty, at Chapter 0, and the words, "Start Here". I had only read the last two of these myself, and Tale of Two Cities had been in my mind for use this year. I wanted to read the books myself, not just teach, so the first thing I did was read Pudd'nhead myself as quickly as I could before I handed it off to my son. What an interesting book! My husband was probably amused as I babbled about its content (without giving away all), and I think I interested him enough that he himself will also read the book. While my son worked on Pudd'nhead, I looked more deeply at the Illuminating Literature materials. As I mentioned, the concept is to create a literature club where the students can discuss the books. One of the methods of doing this can be to create a closed Facebook group (that the parents and students both join). Our Schoolhouse Review Crew did this, and I joined, but I was not able to get my son to engage with this. He does want to home school, and he tries to be obedient and respectful, but he just does not want group situations for home schooling. So, in using the Illuminating Literature program, we had to tweak it to work with my son's style of learning. There are different methods of working through literature guides. My personal preference is to have the student give the book a quick read, and then to go through it a second time while they fill in the answers to the questions in the student book. I do not think I have met a student who likes this method, though, as the student does not want to read the book twice. The second method is to assign chapters and corresponding questions, having the student answer the questions section by section. A third method, which I am encouraging my student to use, is to read the question section first, then read a section of the book. The student can stop and right down the answers whenever he wants to, because he already knows what the questions are. This method also prepares the student for taking college entrance exams like the SATs or ACTs. The author also has an on-line quiz feature that corresponds to the Quiz and Answer Manual that I received as part of the set. I like having the Quiz and Answer Manual so that I have written documentation to keep in my son's 10th Grade Portfolio. Sometimes colleges wish to see the student's actual paperwork, not just the grade the teacher has recorded. The quiz material is broken up into a "Yes I Read It" Quiz and a "Literary Terms Quiz", followed by an "Opinion Survey" (which is graded for "participation", not for their opinion choices). The grade for each literature selection's chapter is based on not only the above three items, but also for the quality of their participation in discussions, completion of lessons and assignments, completion of activity assignment, and completion of the book. The student knows in advance what contributes to the grade, making it easier for the student to know where to apply himself to get the better grade. I like that a lot. I think it is helpful for the student. 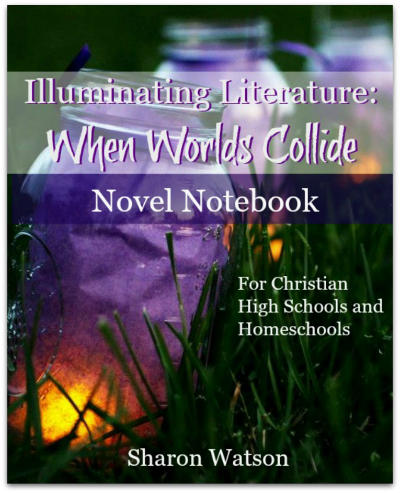 The fourth book provided, the PDF download, is the Novel Notebook. It is a place for the student to take notes while he reads. You might look at it and think, "I don't need to print this out. My student can do this in a spiral notebook." This may be true. I know printer ink is always a painful topic of conversation in my house. When I opened the Novel Notebook PDF, though, my reaction was, "This is awesome! This would inspire my student! This would not use much ink." So, the buyer gets to make her own decision. I take items of this nature and print out one lesson at a time to reduce overall ink impact, or I put the PDF on a jump drive and head to my local copy store. I am loving Illuminating Literature: When Worlds Collide. My son is enjoying the literature choices, but the additional work, not so much. He's not much of a literature guy -- more of a science and technology guy. I do think When Worlds Collide will help him enjoy this year's literature more. 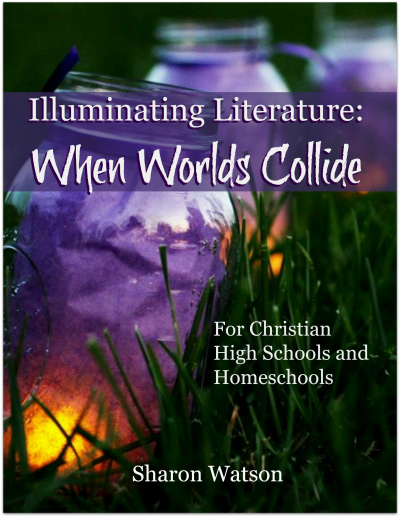 I am so thankful to Sharon Watson for permitting me to review Illuminating Literature. It gets my highest recommendation. If you would like to have a sample view before you buy, downloadable samples and information can be found here. 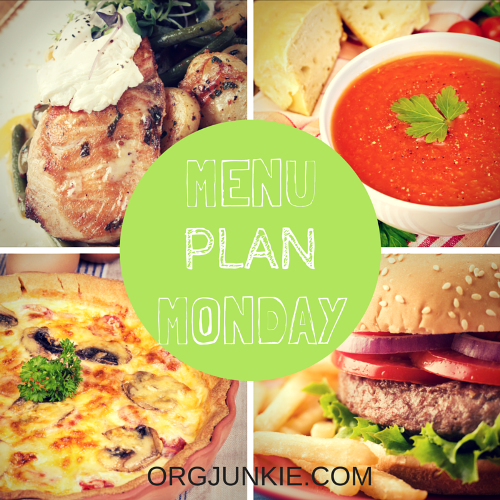 Here is my vegan-carnivore blended menu plan for this week. Sunday (8/16): Working the “Big Cheese” at the county fair; eating dinner at the fair. Monday (8/17): Boy Scout planning meeting with pizza. Friday (8/21): Boy Scout leadership weekend. Eating subs from ?Subway?